Here’s my attempt at an artful shot of my Sweet Secret Stars quilt top. I’m no Camille, that’s for sure. I hope this doesn’t discourage you from trying this Sweet project! 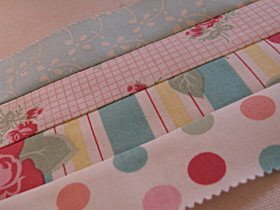 For this project you’ll need a Sweet Honey Bun, Layer Cake, 3/8 yard of pink Bella solid, 3/8 yard green Bella solid and 1 yard of the Sweet border of your choice. If you can bear it, unwrap your cute honey bun and cut the strips in half at the fold. Take as much time as you need, I can wait! 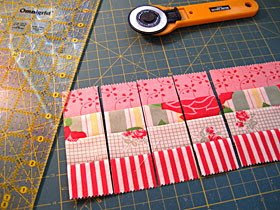 Select 4 of your favorite strips and stitch them together making a strip set. Press seams in one direction. Make a minimum of 16 strip sets. Vary the placement of lights and darks as this will make your blocks more interesting. Cut each strip set into 1 1/2 inch segments. You will need a total of 200 segments. 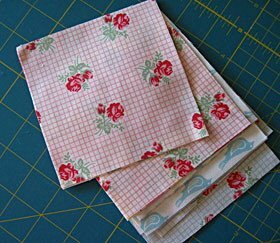 Cut 160 pink 1 1/2 inch squares for your snowball blocks and your half snowball blocks. 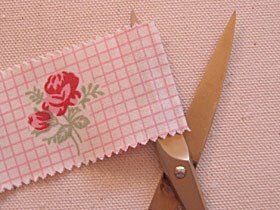 Draw a pencil line diagonally across each pink square, place on larger square and stitch on the line. OR stitch across using your favorite method. For your snowball blocks stitch a pink square on each corner, for your half snowball blocks stitch a pink square to two adjacent corners. Press away from square to create a corner triangle, trim excess from back of block. 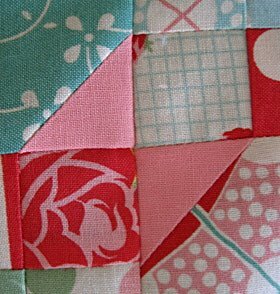 This is where I suggest the line method, so you will have nice points that match up with your patchwork blocks. Unlike mine, which match up, some of the time. For this quilt you will need 31 snowball blocks, 50 patched blocks and 18 half snowball blocks. Layout your blocks as shown in the photo of the quilt below. The half snowballs blocks have their pink points facing inward. Begin and end row 1 and all odd rows with a patchwork block, alternating blocks. Row 1 and 11 will have only half snowball blocks, row one facing down, row 11 facing up. Even rows will begin with a half snowball facing to the right and end with a half snowball facing left. From Bella Solid green cut (5) 1 1/2 strips. 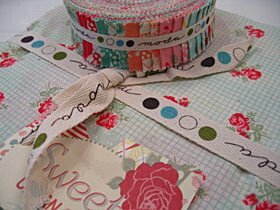 Measure length of quilt, stitch 3 strips together and cut two strips for side borders. Stitch to sides of quilt. 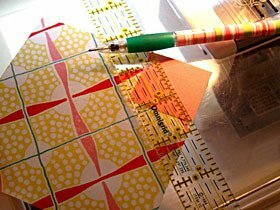 Measure width of quilt, using remaining strips cut top and bottom inner border. Stitch borders to top and bottom of quilt. From Sweet Border print cut (6) 5 inch strips. Stitch 3 strips together for one long strip. Measure length of quilt. Cut two strips for side borders. Stitch to sides of quilt. 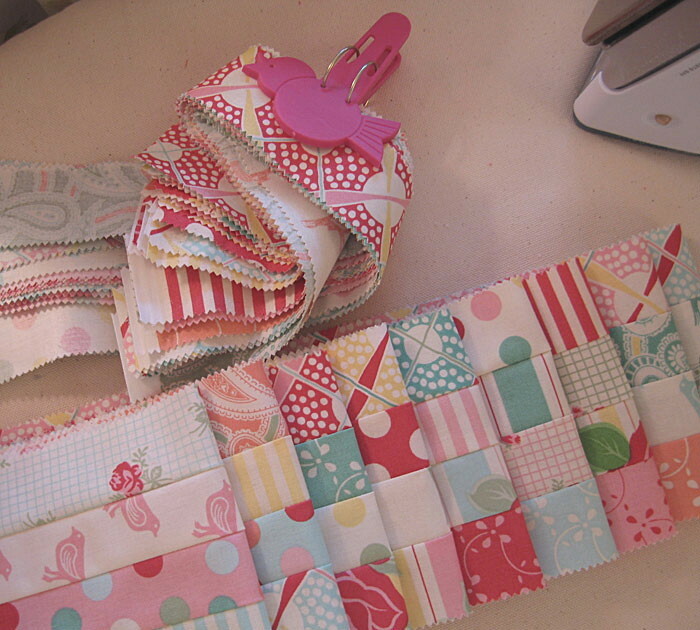 Stitch remaining 3 strips together, measure width of quilt, cut two strips for top and bottom borders. Stitch to quilt. This quilt would be called Sweet Not So Secret Stars had I reversed the green and pink, the green is a higher contrast and would show off more. But I like the subtle nature of the pink.. so there you go. You can decide for yourself which you like best. You could use your squares plain and it would be just as Sweet! One 56 x 48 inch Sweet Quilt top! 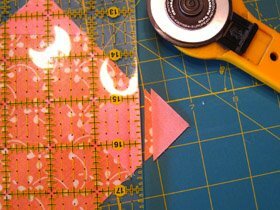 Stitch your segments into units of 4. This is where you’ll thank me for suggesting you press those strips in one direction. You will need 50 blocks. 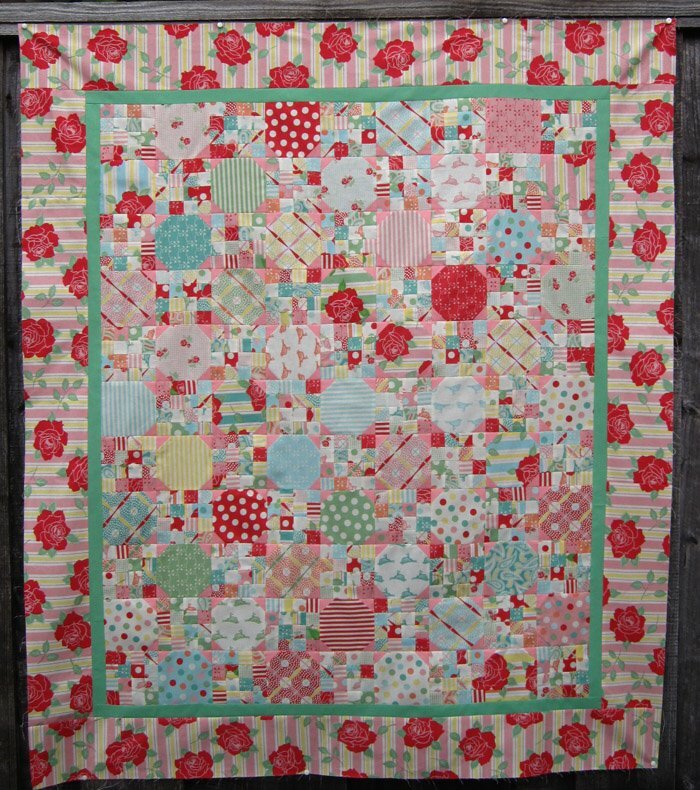 This entry was posted in Honey Bun, Layer Cake, Moderate, Quilt and tagged Bella Solids, Pam Kitty Morning, Sweet, Urban Chiks. yet another quilt to add to my [i want to make] list!! … i love that you said “Take as much time as you need, I can wait!” ..some pre-cuts are soo cute it takes me a while to open them… i just want to make a display and look at them!!! …and your photography is looking good.. i'm working on getting better at mine!! That is so adorable! Thanks for sharing! Aren't we all camille want to be's? Fabulous quilt Pam. I now officially have too many quilts in my head I want to make and too little time. ooh lala…love it! Totally 'sweet'. Pam it's fabulous!!!! So love that fabric. Think I always will. You ARE the queen of cute, miss Pam 🙂 Adorable quilt. And that artful shot==right up there with the best of them!! Adorable PKM! Love the border too! 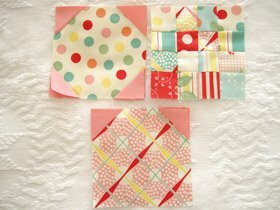 The tutorial for the quilt are very easy to understand which really helps a left handed gal like myself think straight. Love that See Rock City…I get visions of 1980s big hair bands! Ha! 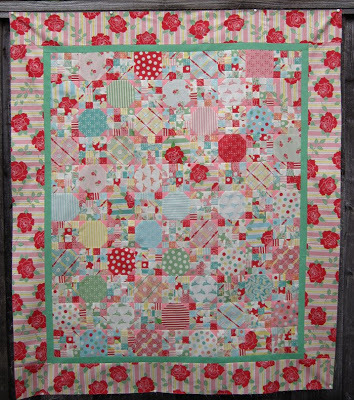 Cute, cute, cute little Sweet quilt Pam. The attention to detail is perfect. Couldn't be sweeeter. Good job. Love this one. So stinkin' cute I want to cry! And your photographs are beautiful! Just as I was whittling down my to-do list, you throw this darling project on my list! Love the project, love the pics, love the fabs, love you! I feel like such an outsider ,I can't even sew! :O I come from a long line of hand quilters but somewhere in there by the time I decided to learn anything health got in their way of teaching me.Now Im just a dreamer,wishing I could quilt. This is beautiful and would be perfect for our daughter we are adopting due in November. I wish I could put it on my to make list but….I guess I'll have to put it on my ,”I WISH I HAD THAT”! list.Wow my day is prettier now just for seeing it. Oh and P.S. any of you smart quilters make quilts for the puplic and would like to make this for me ,shoot me an email. Hope this was ok to post.Ok I'm gonna hush now with my book. Love the cart! I have one too! I keep mine inside. Perhaps I should make a quilt for mine! Pam….this is such a precious quilt! I love it! I am going to keep my eyes open for a layer cake and matching honeybun on sale so I can make one. Thanks so much for sharing your fun design! Love it! Your projects are always so cute! 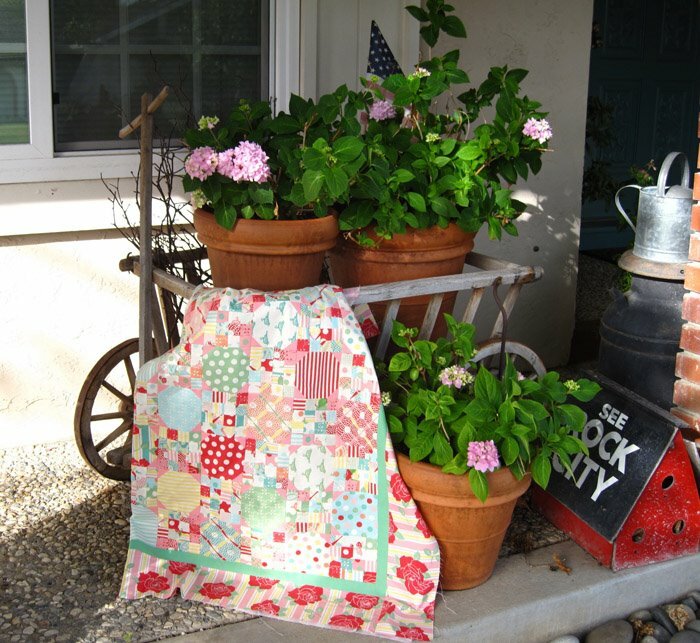 I just love this quilt, way too cute! Very cute Miss Pam!!! Very cute. Such a sweet little quilt! I keep missing out on getting some of those fabric sets at the local shop, oh well. And the photo is nice, maybe you need a flash diffuser though? A piece of translucent scotch tape over the flash on a small camera works great! I've admired you for some time now and just so you know…you're awesome too! Love the quilt!